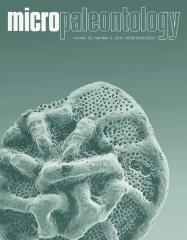 ABSTRACT: Orbitolinid foraminifers supply important information for the understanding of Cretaceous marine biogeographic and paleoclimatic conditions. A pre-requisite for these palaeoenviromental interpretations is a sound taxonomy. The taxonomy of the orbitolinids from the Northwest Pacific has been controversial, and this paper aims at a taxonomic and stratigraphic revision of this group. Four orbitolinid species (“Palorbitolina lenticularisâ€, Praeorbitolina cf. wienandsi, Mesorbitolina parva, and M. texana) have been recognized. Orbitolinids occurred almost continuously from the Late Hauterivian to the late Early Albian. Species belonging to the Praeorbitolina cormyi–Mesorbitolina aperta evolutionary lineage are most common, while dictyoconids are missing in the Northwest Pacific. Following the last occurrence ofM. parva in the Douvilleiceras mammilatum Zone of the Early Albian, no orbitolinids have been recognized in the Northwest Pacific. It is possible that provincialism in orbitolinid foraminifers occurred during the Early Cretaceous of the North Pacific.